This week’s article on interior design of basements, third in the series, focuses on ways to create a basement bedroom that is both functional and beautiful. Remember: “Beauty is in the eye of the beholder” so individual tastes and preferences strongly influence design selections. If you prefer a bedroom that has a sturdy, rugged look, your design plans might include beams and wall trim of rough-hewn or weathered wood. If, on the other hand, you prefer a look of comfort and softness, your basement bedroom might feature a ceiling lined with puffed fabric, egress windows graced by billowy curtains, a shag rug for the floor, and a bed decked out with a fluffy down comforter and several pillows. Choose a location in your basement that will offer enough room for the look and feel that you want. You need to have adequate space to accommodate the persons who will use the room, and you need to allow for the required installation of at least one egress window. In order to be functional, the window must remain accessible at all times. This means that you cannot place a bed or other furniture where it could interfere with the ability to exit the room through the window’s opening. In your design plans, you may want to include a box-style storage bench to fit the space below the egress window. A bench seat that is hinged rather than solidly attached allows the bench to function both as a place to sit and as storage space. Another way to design the storage bench is to solidly secure the top and install either sliding or hinged doors on the front. A built-in bench with full-height cabinets at the window’s sides gives a neat, organized appearance to the room. Don’t forget about the closet. Try to consider the potential needs of the bedroom occupant. Will it be sufficient to have a closet deep enough to simply fit hanging clothes? Or will a walk-in closet be required? Pay close attention to the width and height that is needed for the bedroom doorway. If you want a bedroom that gives complete privacy, you need a door that can be fully closed. Think about how you will move furniture in and out of the room in choosing the door’s location. 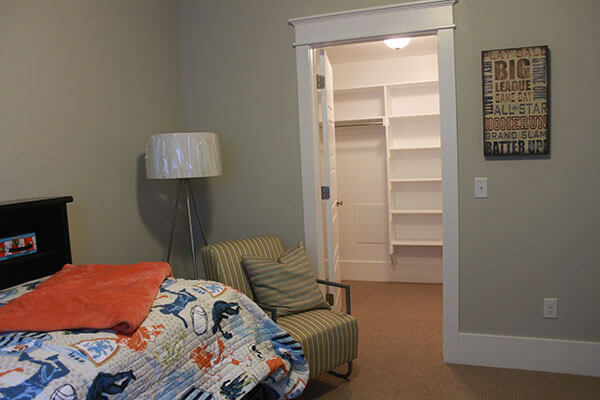 Design the doorway so that it is easily accessible and the room’s open door will not bump furnishings or walls. If available space is limited, choose a sliding door that hinges at the top. Another option is a folding door, often called an “accordian” door. French doors are a third option. Because French doors hinge at the sides and open in the middle, each door when open occupies only half the space of a regular door. Because air circulation can be a problem in basements, you may want to include a ceiling fan in your design plans. Usually, the fan is placed near the center of the room. If the room’s door is likely to be kept closed while it is in use, add air vents. The vents can be placed through the bedroom’s interior walls as well as in or above the door. The International Code Council requirements for residences state that there must be an egress window system in every basement bedroom.You may even want more than one egress window well to ensure lots of natural light, plentiful fresh air and added safety for you and your family. If support posts exist inside the room you are planning, incorporate them into your design plans. They offer excellent opportunities for creative thinking. You can paint them, weave fabric around them, frame and panel them, or make them part of your construction for cabinets or closets. If you build panels around them, you can use the panels to display artwork or add hooks for hanging purses, coats and other items. The possibilities are endless. 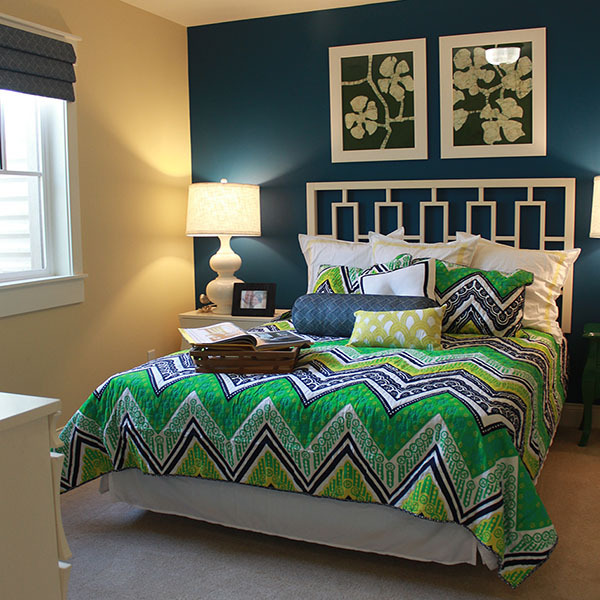 Picture the finished bedroom in your mind, jot down what you see, and fit the special touches into your design plans. The completed project will give you a feeling of pleasure and satisfaction for years to come.